Laser Cutting & Punching | Quest-Tech Precision Inc.
As a full-service metal fabrication shop, Quest-Tech offers its clients laser cutting and punching that is not only time-saving and cost-effective but also capable of providing quality finished products. CNC, or computer numerical control, laser cutting has gained in popularity in recent years. 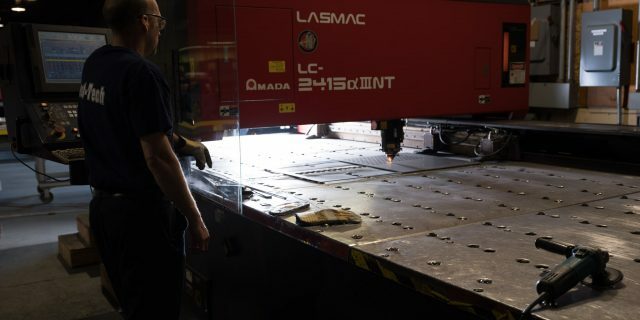 As a result of its inherent benefits, laser cutting is widely used across a variety of industries, producing effective results and offering benefits and applications that other types of metal fabrication processes cannot. In fact, one laser cutting machine can quickly perform multiple operations, making it extremely efficient. Laser cutting is the act of cutting material with a high-powered laser beam by essentially melting or vaporizing the target material with the beam. Once piercing the material at hand, the beam will cut with precision and accuracy, all while providing an exceptionally smooth finish. As a result, it can cut more complex designs and shapes, and trim materials to exact specifications better than typical punch presses. Ultimately, laser cutting, via pulsed beam or a continuous wave beam, runs through materials more easily, and with a greater level of detail than other cutting methods. A punch press is a machine that shapes and cuts metal as it passes through or under a press. The material is clamped in place and can be shaped or formed to a given custom design. Punch presses can be small, manually operated machines, or much larger, industrial presses operated by CNC. CNC programmed presses offer flexibility and versatility in producing complex designs. Quest-Tech’s punch presses utilize 45 station turrets, several of which are auto-indexing, making them capable of punching nearly all of our customers’ needs. We utilize two types of CNC punch press machines from the Amada Vipros, which is notable for its custom embossing capabilities, to the Amada Pega families, which are known to be both reliable and efficient. Just about any sheet metal cutting process can be handled with automatic CNC punch presses utilizing the appropriate punches and accompanying die sets to help shape and cut metal. Simply put, a die set consists of male punches and female dies. The punch passes through the sheet metal into a die and forms the piece. Punching is a cost-effective method for cutting metals in medium to high production volumes. Quest-Tech’s punch presses are capable of handling sheet sizes up to 5×12’, and potentially longer (repositioning of clamps), with limitations of 3/16 of an inch in material thickness. Quest-Tech is proud to offer a variety of laser cutting and punching services to fit the needs of a variety of industries. If interested, have our experienced team review your engineered drawings to determine what’s best suited for your application. Want to learn more about our capabilities? Contact us online today!